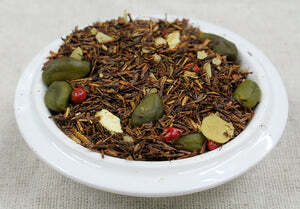 Ingredients: Rooibos, almond pieces, pistachios, orange peel, coriander, peppercorns. Gingerbread houses are the fun and whimsical decoration we enjoy around the holidays. We'll usually keep ours around long after New Years. Like gingerbread cookies, this tea has no actual ginger in the blend, but evokes the taste of our favorite holiday cookie. Rich sweet rooibos pairs perfectly with almonds and pistachios, with notes of spicy peppercorns in the background, and a hint of orange on the finish. Mug (8oz water):1.5 level tsp • 205º • Steep for 5 min. 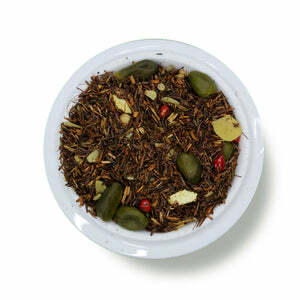 Although there is no ginger in this "Gingersnap" tea, the flavors are amazing. Very smooth, rich yet mellow flavors to tantalize the taste buds. My favorite thus far. Perfect for this time of year.